Minesweeper puzzles are one of those classic puzzle types that most of us will have played at some time: and for those who like doing a puzzle on their computer when they have a few minutes spare, then minesweeper may be a particular favourite! In minesweeper, the rules are quite simple. 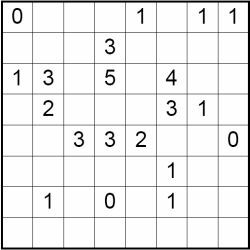 There are a series of mines placed around the puzzle grid, and some of the cells contain numbers. These numbers tell you how many of the adjacent squares (including the diagionals) contain mines. The cells that contain numbers themselves are not allowed to contain mines. Therefore through using logic alone the one unique solution can be reached. There are two variations of the puzzle. The first variation does not tell you how many mines there are in the puzzle, and the identity of every cell is determined by the numbers in the puzzle: that is, whether it contains a mine or not. The second version tells you how many mines there are in the puzzle, and therefore you need to keep count as you go through, because each cell that is not 'safe' must contain a mine. For instance if there are 13 mines to place and you know where 11 of them are, and know that all but two other cells in the puzzle are safe, then those two remaining cells must contain the final two mines. All puzzles have one solution that can be reached without guessing but rather through the application of logic alone. Minesweeper puzzles are great fun, the rules are simple to grasp, and they are therefore a great puzzle for publication in any newspaper or magazine. If you are interested in buying minesweeper puzzles, then please contact us with your requirements.